Run-On Sentence: so clearly i am just a lazy, unmotivated person, HOWEVER i have a somewhat legitimate excuse for not writing here much…for the one or two people in the world that haven’t had me whine to them about it, i sliced up my middle finger on my right hand pretty badly several weeks back, and typing has been a painful chore that’s been beyond my ability for quite some time. just recently i’ve gotten to the point where i can kind of type without use of my injured finger or causing myself pain, but not for long. Supplementary Sentences: so when i’m back to full typing/writing strength, you’ll know it. 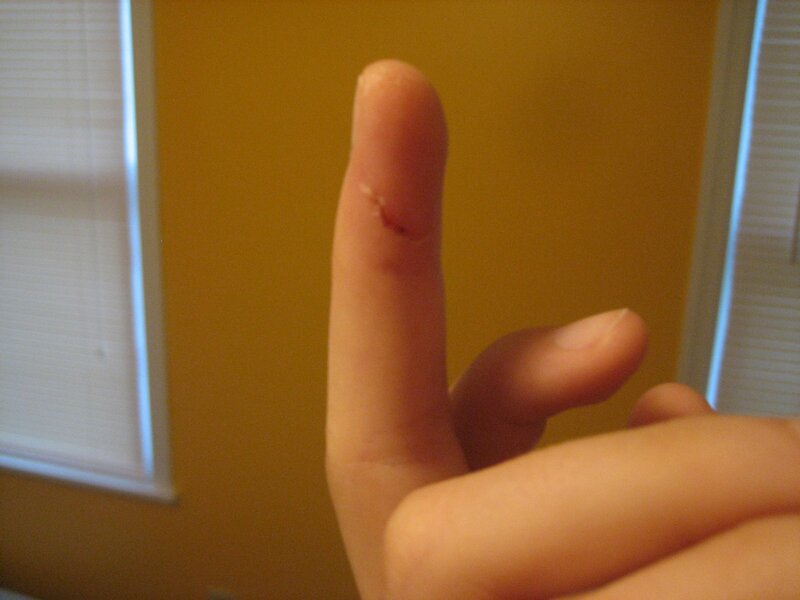 in the meantime, here’s a picture of my life-threatening finger injury. this is an older shot of the wound, about a month after it happened. numbness on one side, extreme pain, and the total inability to put any weight/pressure on it. fun times. it’s really cut into my calligraphy training.